One of the New Year resolutions was my email migration! Yes, it was a task that I was dreading for a very long time. Since the beginning of my career, I had set up a Hotmail email account. This email account was the one my clients used to get in touch with me for projects, help or simply to just say “hello”. I had created a folder with each client and stored every single email I had ever exchanged. So, you can imagine why I was postponing and postponing this painful task. However, since the creation of the website and setting up email addresses based on it, I never really thought of practically using these new addresses. After further consideration, I realized (by looking at this issue through the eyes of a client) that when a client receives an email for a Hotmail/Gmail or any other online email account may actually not pay the required attention to its content, or at least the required attention I would like the client to pay. Although my Hotmail account had faithfully served me during the past years, an email address connected to a website is and shows to be more professional. 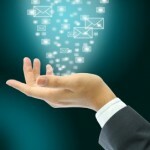 Migrating an email account to another is not as a difficult task as it may be considered. All that needs to be done is forwarding emails from one account to another (in the case of Hotmail: Click on settings (an icon resembling a nut on the top right hand side of your screen), click More mail settings, Email forwarding, choose Forward your mail to the following email accounts and add the account you wish your mail to be forwarded to. Finally, click Done. And it is done! Now whenever an email is sent to the old address will automatically be forwarded to the new one! If you have set filters and all mail from email addresses you have not saved in your address book land in your spam folder, then these are not going to be forwarded to your new email address. If you have not set filters, then all mail will be forwarded to your new one. When an email account is not used for a while, then it becomes idle and could possibly be deleted. Or at least, this is what Hotmail suggests when you click on Email forwarding. In fact, the exact message Hotmail automatically displaces is: Please sign in at least once every 365 days—otherwise your account looks inactive and could be deleted. Now, if you are like me, and have stored countless emails on this online account, you do not wish this to happen. You have two options: to log in every now and then as the message suggests (you will be doing this anyway if you have set spam filters to check what has landed in the spam folder, as sometimes although you may have saved an email address and Hotmail recognizes it and directs it to your Inbox, another employee of the same company may contact you and Hotmail will divert it in the spam folder). If you are absentminded like me and worry about totally forgetting to log in, you can download a free software that creates and stores your email locally. After some research I chose MailStore Home. The software is brilliant! All you need to do is add your online email account and it takes care of everything! Downloading and archiving all mail may take some time, or the long process may time out. Do not spare! Restart the procedure as many times as required and eventually it will complete the archiving of all mail locally. Actually, it stores all folders together with their content and the local copy will look exactly the same as your online archive. You could also upload all the old emails on your new email account! Now, you have backed up your old account and put your mind to rest. In case you are considering migrating your email, it is wise to extensively research what the best migration option matches your online account before commencing. There are different software to choose from, some match certain online email accounts better than others. Good luck! Thanks for the post! I think that MailStore is a great mail archiver to store Gmail and Yahoo emails on our computer, etc. It is very important to have stored all our emails and not have to worry about it. I use a DMS that includes a fairly powerful mail archiver: OpenKM with which you can manage all your emails and avoid unnecessary losses. An email archive is very important to freelance translators (or all professionals in fact), as they can trace any email that was received or sent. Also, having a company email makes a contribution to the professional image of a freelancer. You have, indeed, contributed valuable information!